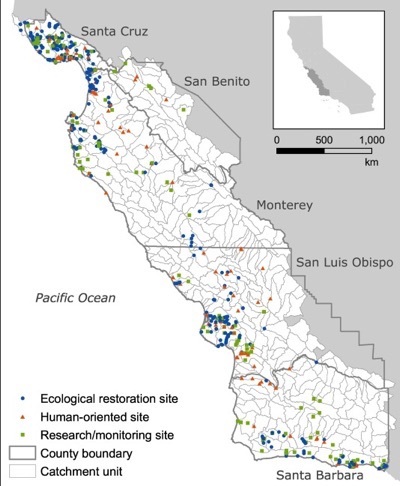 A new study looked at 699 sites of publicly funded stream restoration projects between Santa Cruz and Santa Barbara counties that were completed between 1983 and 2017. In addition, coastal stream restoration is heavily concentrated in Santa Cruz, Morro Bay, and southern Santa Barbara County, creating "restoration deserts" with virtually no activity, said lead author Bronwen Stanford, a doctoral candidate in environmental studies. "Restoration projects were really unevenly distributed, and a lot of the Central Coast had no projects at all," said Stanford. "This disparity is troubling for social and ecological reasons. It begs the question, are we overlooking certain communities or certain types of ecological sites?" Stanford's paper, "Where and why does restoration happen? Ecological and sociopolitical influences on stream restoration in Coastal California," appears in the May issue of Biological Conservation, which is online now. Stanford's study looked at 699 sites of publicly funded stream restoration projects between Santa Cruz and Santa Barbara counties that were completed between 1983 and 2017. Stream restoration projects benefit ecosystems by improving fish habitat, water quality, and riparian habitat—the interface between land and rivers or streams. Human-oriented benefits include improved recreational access, flood protection, and educational outreach and training. Stanford's analysis found that restoration projects target many areas of ecological need. The presence of native fish was the biggest ecological factor driving the distribution of restoration sites, with steelhead present in 95 percent of sites. Water quality and riparian conditions were other environmental drivers. First, communities with higher incomes could be better able to provide matching funds required by most restoration grants. Second, wealthier residents with higher levels of education might be more adept at securing a disproportionate share of restoration funding. Third, local demographics may influence the location of restoration organizations, which in turn may influence site selection. Stanford found that restoration is often dependent on the existence of a local organization, and they are more likely to be present in areas with wealthy, white, and educated populations. The results suggest that not all residents are benefitting equally from public funds spent on restoration projects, and not all areas of ecological need are getting attention, said Stanford. "Most restoration was hyper local—happening within 12 miles of a restoration organization's office—so we might be missing some really important sites that aren't right next to an office," said Stanford. 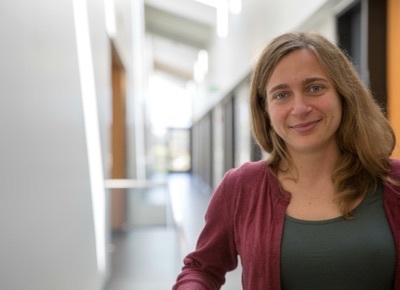 The social disparities didn't surprise coauthor Erika Zavaleta, a professor of ecology and evolutionary biology at UC Santa Cruz. "We know that other environmental benefits, like clean air and water, are not equitably distributed in California to even greater degrees," said Zavaleta. "Whatever the cause of this inequity, the outcome is a relative lack of restoration investment in lower-income communities with larger populations of color and with less college education. Environmental quality is foundational to health and well-being, and disadvantaged communities need more investment, not less." Conservationists, she said, can and should be looking for opportunities to restore sites and take on other environmental projects in communities where these investments are lacking. "They could be social, as well as ecological, game changers," she said. Stanford, like Zavaleta, suggests a more diverse conservation workforce would help benefit more types of communities, and she called for a regional approach to environmental planning. Ross Clark is director of the Central Coast Wetlands Group at Moss Landing Marine Laboratory, which performs restoration work from Santa Cruz to Santa Barbara with a focus on the Salinas Valley. He agrees that a regional approach is desirable. The challenge of how to distribute state funding more equitably is complicated, in part because funding waxes and wanes, and priorities shift, he said. "Preferential selection" for state-funded water projects that benefit disadvantaged communities will help. "But there are still huge hurdles to overcome," said Clark. "To develop a project—to apply for and administer grants—requires a significant amount of infrastructure, staff, programs, and coordination among local agencies and nonprofits. Lower-income areas just don't have the same levels of support to get these projects." Clark favors an approach that integrates environmental objectives into long-term water-management efforts that currently tend to be focused on storm water management and water quality, rather than ecological restoration. Adam Millard-Ball, assistant professor of environmental studies at UC Santa Cruz, is the third coauthor on the paper.